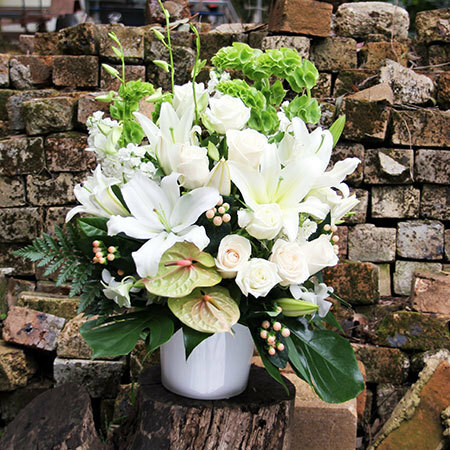 Packed with flowers, this magnificent white sympathy flower arrangement is a beautiful way to express your deepest compassion in the passing of a friend, relative or loved one. 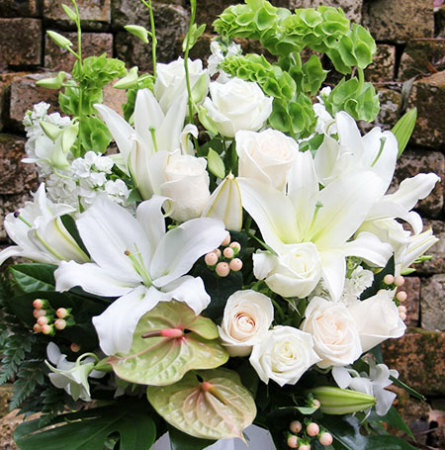 Our florists have designed a long-lasting floral arrangement featuring slender lime green `Bells of Ireland` and lush foliage, teamed with perfumed white oriental lilies, pure white roses, berries, seasonal orchids and tropical anthurium lilies - all displayed in a classic white ceramic pot for ease of display. 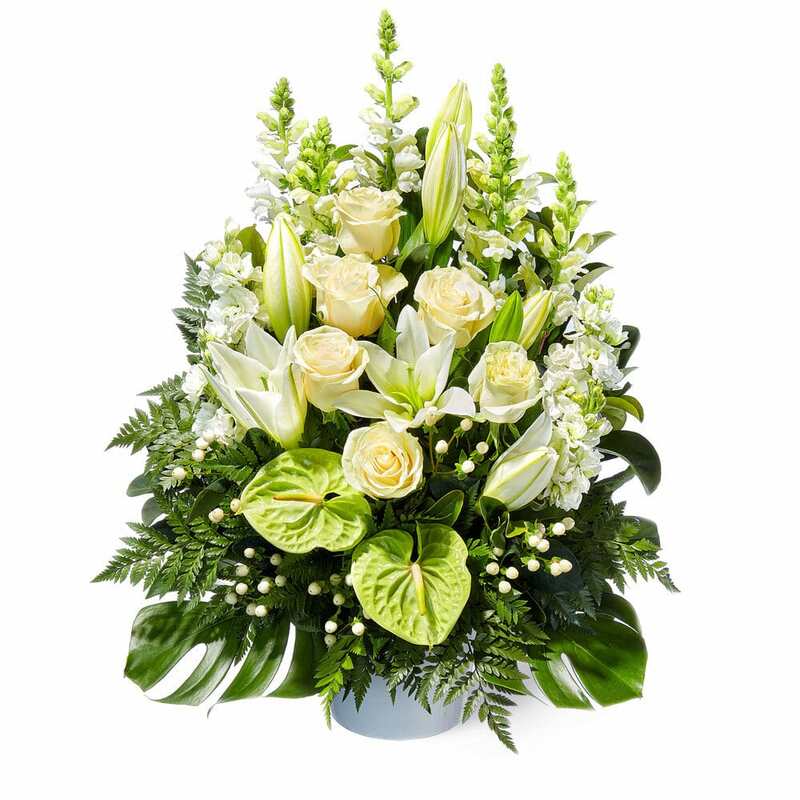 You can either send these sympathy flowers online or by phoning our friendly consultants toll free on 1800 66 66 46. *Please note: The pictured flower arrangement is exclusive to Sydney only. For flower delivery outside Sydney, the team will coordinate your sympathy arrangement via an affiliate florist network to recreate our style, colours and presentation as closely as possible. 2019-01-10 Service rating : Delivered the flowers promptly, my aunt telephoned and said they were beautiful, very happy. 2018-12-12 Excellent service and communication, The flowers arrived nice and early and were beautiful. 2017-03-04 Very easy to order, prices were reasonable and exactly what I ordered was what was received, which is sometimes a bit tricky when ordering on line. I will use them again. 2017-01-24 Service rating : Flower arrangement looked very close to pic, thanks. Great service as well. Product : Very happy with everything, thank you. 2016-12-21 Service rating : The flowers were just like the picture, beautiful. They were watered daily as instructed but there was also no food sachet as described in the attached info sheet. Flowers were bought for my grandmothers passing but they didn`t even last to the day of the funeral which was a week later. Product : Another set of flowers were delivered from the same company (bought by someone else) also no food sachet attached. 2016-12-15 The flowers delivered were nothing like those pictured. I recognise that subsitutions need to be made based on seasonality of flowers and other factors. Hoever the arrangement delivered looked sparse and lifeless. After receiving my complaint I did receive a $30 voucher in return for the poor standard, however this is not the point. 2016-12-08 Really well organised and good communication! Flowers were amazing!! Product : Recipient told me they were beautiful and the flowers I asked to be added to the arrangement were added. 2016-09-26 Service rating : Flowers receive on time, looking beautiful. Product : I was assured the flowers looked fresh and beautiful. 2016-09-26 Service rating : Fantastic website, easy to use - flowers delivered to the right address - no hassle, no fuss. Thank you. Product : Gorgeous flowers, beautifully presented - perfect for the occasion. 2016-09-01 Website easy to use. Flowers delivered as promised! Very quick! 2016-08-25 Service rating : The customer service was prompt to my email enquiry. Order form in Website is well designed to use. The flower was delivered on time as requested. Product : I had a slight disappointment as the flower didn`t look beautiful as on the web. 2016-06-21 Can`t fault the service. I`m in the US and they got my flowers to a funeral on time. My one gripe would be the card. It looked like comic sans on a scrap of paper on the photo I saw. A little touch that lacked quality, probably intensified with them being flowers for a funeral. Aside from that thank you. 2016-06-21 Easy transaction & fast delivery. 2016-06-15 Service rating : I have been using flowers for everyone for years for both Business and Personal use. I have never had an issue and the quality and promptness is always outstanding. The prices are great too. I love taking advantage of the 10% discount offered by being a member. The flowers are always fresh and of a high standard. The only suggestion I would have is some florists email a photo of the finished product before it is sent tot he recipient. I would like to receive this from Flowers for everyone. Product : I didn`t get to see it unfortunately. The picture online was beautiful and the price was good but I would like to have the end result emailed to me. I know this is more work for the florist but it is really nice for the person buying the gift to see what its being sent. 2016-06-06 Service rating : The website is effieient for on line ordering but even when I ring to ask the staff are always lovely. I have had many satisfying experiences with your company and products. Product : Beautiful - the flowers were slightly different then the website picture but nonetheless beautiful. 2016-05-04 I couldn`t be happier with our partnership with Flowers For Everyone! The products are absolutely beautiful and made to perfection. The customer service is excellent. The staff are very accommodating to our needs, whether it`s bespoke requests or quick turnover/delivery. We have had a lot of positive feedback from staff and clients who receive Flowers For Everyone products. 2016-04-28 Service rating : Ordering was easy, it arrived on time. The only feedback would be to provide a space to leave a comment when ordering. Product : Flowers were beautiful. Exactly as they appeared on the website. 2016-04-05 Delivery service was brillant - arrived early for a 10am funeral service. Thank you. My flowers were delivered to the funeral home, however no card was left with them so our relatives did not know they were from us. Very disappointed as I`m overseas and they didnt get to appreciate our flowers. Product : As our flowers were not left with the card, our relatives did not know they were from us. I`m overseas and was not able to attend the funeral, and do not even know if they arrived to be honest as theres no way for me to verify it. Lu, who took my call, knew the whole process. She had it all streamlined for me. Everything all organised for me within a 5-10 min call. Very straight to the point. Delivery within a day. 2015-09-24 Service rating : Reliable and realistic. The picture of the flowers selected are exactly what is delivered. Ordering is a breeze and the delivery is on time. Product : Great choices and options to expand the gift with quality items. 2015-07-02 Service rating : Very easy to choose from the website and I ordered over the phone very quickly. Product : My friend said the flowers were beautiful and she loved them. So I was very happy too. 2015-05-12 Service rating : Fantastic service, thank you. I needed the flowers to be delivered urgently without much lead time and you delivered within a very short time frame. Much appreciated. Product : Receiver was very happy with the flowers delivered. 2015-05-05 Service rating : Very helpful answering my queries. Product : I haven`t seen the flowers myself - But the feedback that I got that there were beautiful.